1. The concept of free speech – or the freedom to express words as well and deeds in accordance with one’s own will and belief and conscience – has a long history. Some say that the seed of such an idea runs back thousands of years ago, way back during the time of the ancient Athenian democracy. 3. There is a reason why this part of his opinion has become so famous and has been so often quoted time and again whenever the topic of free speech is deliberated upon. It is because in a very short and concise paragraph, he aptly and precisely summarized the fundamental principle, that forms the core – the inherent attribute – within that concept that we call freedom: namely that freedom must of necessity always be paired with responsibility; that the right of a person as an individual must always be checked and balanced with the right of the public at large; and that freedom must always be save and in accordance with the law. 4. When one talks of the law, especially in the local context, the first thing that must come to mind would be the Federal Constitution, which, by virtue of Article 4 therein, is the supreme law of the country, and any law that is inconsistent with the provisions of the Federal Constitution shall to the extent of such inconsistency be void. It is the grundnorm; the very basis or foundation for the existence of every other laws; it provides for the very structure and framework of our nation; and without which, our nation simply could not work as a nation. 5. Since the Federal Constitution is supreme, one could even argue further that any law that is specifically mentioned in the Constitution must not be treated lightly; it must rather be treated as a class of its own. And this is the case with the Sedition Act, where such specific reference could be found in Article 63(4) of the Federal Constitution. 6. There are hundreds, if not thousands of pieces of legislation that are currently in force, but this one piece of legislation – the Sedition Act – is given the exalted position so as to be specifically referred to in the supreme law of the Federation. Naturally, one would ask why this is so. 7. The Sedition Act was passed by the British administration in 1948 as the Sedition Ordinance 1948. It came into force into the then Malaya before independence, and prior to the existence of the Federal Constitution. In 1969, pursuant to a revision made by authority of the Revision of Laws Act 1968, this Ordinance became known by the name it is referred to today, the Sedition Act 1948. 8. The essence of this Act is that it criminalizes utterances or publications or expressions that are seditious in nature – wherein the term seditious tendency is defined in section 3(1) of the Act. So naturally and admittedly, the Act indeed restricts freedom of speech and of expression, if they tantamount to sedition. 9. While in today’s political climate any form of limitation to freedom is often frowned upon as being backwards and undemocratic, one must however never lose sight and be mindful of what has been mentioned earlier on: that freedom must always be within the ambit and in conjunction with the law, and that the Sedition Act is but one of such law that limits such freedom and puts responsibility upon the shoulders of individuals who utters or publishes words or expressions. 10. This, I think, is the very spirit of the Sedition Act: while you may have the freedom to say whatever you so wish, you however must not offend the public’s sentiments. And here, what Justice Holmes said bears repetition: freedom of speech does not mean you have the right to shout fire in a theater full of people and thereby causing havoc and panic. 12. Recent events however, have shown us that there have been calls from certain quarters that this Act should be repealed. In fact the Bar Council recently passed a resolution to call for its abolition, followed by a walk disguised by them as the Walk for Peace and Freedom. I use the word “disguise” here very seriously, and with emphasis, because I believe a walk to call for the decriminalization of sedition – a walk that is pro-sedition; saying that people should be free to be seditious without the responsibility to face the law – could never be said to truly be a walk for Peace and Freedom. At best it can be disguised as such, but it can never really be. 13. Many reasons have been given as to why they call for the abolition of the Sedition Act. They say because it restricts freedom of Speech; they also say that this Act, which aims initially were to ensure stability in this beloved multiracial and multi religious nation of ours, had been abused by certain quarters and treated nothing more than a political tool to silence critiques of those in power. They even say that it is a draconian law, no longer relevant in today’s modern democratic world. There has been selective prosecution, they further assert, targeting only members of the opposition who speak against the ruling party. 14. We are very fortunate today as we have Associate Professor Azmi Sharom sitting as special guest among the audience, who has been charged under the Sedition Act, supposedly for offering his opinion as an academic. They say, the charge against Dr. Azmi is an example of such abuse, and that is why we should repeal the Sedition Act. 15. I do not know the details, and I do not have the privilege to look into the charge sheet and the other cause papers in relation to Dr. Azmi’s case. But what I can say, based from my very limited access into the details of the case is that – and they say the devils are always in the details – there is indeed a pressing need for us to ensure academic freedom, and we must fight and think of ways how this could be achieved. 16. But that said, abolishing the Sedition Act is not the answer, and in fact I think it is too simplistic a thought to think that repealing the Sedition Act would settle all the problems arising from its so-called abuse. Because repealing it does not address the problem, and instead would simply open the floodgates for greater damage – damage to the Malaysian framework. 17. If academic freedom is what we want to achieve, or if preventing abuse is what we want to address, then, the call to abolish the Sedition Act is simply disproportionate to what we seek to achieve. 18. Although the Sedition Act was enacted and came into force under the British administration in 1948, the fact is that later on, following events of 1969, the Act was revised, and in which, the provision of section 3(1)(f) was inserted. So it is no longer right for us to say that it is a piece of outdated colonial legislation. 19. This section 3(1)(f) that was inserted in the 1970 revision is very important; it is pertinent as it protects the fundamental and immutable provisions of the Federal Constitution. It is a provision which was included as a bastion against unwarranted attacks to the basic structure of our Supreme law, and these include the position of the national language (Article 152), the rights of the Malays and the natives of Sabah and Sarawak (Article 153), the sanctity of the Monarchs (Article 181), and also on questions of citizenship (Part III of the Federal Constitution). 20. These constitutional provisions form the core terms of the social contract that was agreed upon between the multiracial and plural society of the Malayan people before independence. In a sense, it was a quid pro quo between the various segments of the people – that while the Malays and the other indigenous people of Malaya agreed to allow citizenship to be granted to the non-Malays, namely the Chinese and Indians; the non-Malays on the other hand agreed to accept – without question, if I may add – these five pillars as the Malayan identity:- (i) Islam as the religion of the Federation; (ii) the Rulers as the sovereign head of the Federation and of the respective States; (iii) the position of the Malays and the indigenous people; (iv) bahasa Melayu as the national language; and (v) the citizenship of the other races. 21. One can draw an analogy to a contract with simpler terms. Suppose one enters into a contract or an agreement, say, for a purchase of a car. And suppose it was agreed that you would pay a hundred thousand ringgit, and as a consideration of which, the other party will then hand to you a brand new car. Can you, then, in later time, after having received the car, question the hundred thousand paid by you? Of course, no, because that is the term agreed upon. You must not question it. It is also worth bearing in mind that social contracts of this sort are not limited to our own nation. Another country further to the south, namely New Zealand, or known natively to the indigenous Maori population as Aotearoa also has a social contract between the native Maori people and the subsequent British settlers, the Pakeha. This social contract in New Zealand is known as the Treaty of Waitangi, and forms the basis of the constitutional structure of New Zealand till this very day. 22. In Malaysia, our social contract finds expression in the provisions of the Federal Constitution. And like any other contract, its terms must be honoured, in particular with regard to the basic structures thereof. The consideration offered in relation to the terms of this social contract has already been given. As Dr. Chandra Muzaffar puts it, at the stroke of midnight on the 31st August 1957, the government of the then Malaya gave citizenship, literally overnight, to more than a million Chinese and Indians. So can they now, after having received and accepted such consideration, question those immutable provisions in the Federal Constitution? 23. While Article 159 no doubt provides for the procedures for amending the provisions of the Federal Constitution, the Sedition Act, on the other hand, protects the five pillars mentioned from being brought into question. In fact, it cannot even be questioned in parliament, and this, we may see from the clear wordings of Article 63(4) which states that while members of parliament are accorded with legal immunity from whatever they say in the House, such immunity however does not apply if what is being said is an offence under the Sedition Act. 24. This is why I think that any call to repeal the Sedition Act is nothing less than an affront to the Federal Constitution. It is an attack against our supreme law, a sacred document, which Professor Shad Saleem Faruqi has called our Document of Destiny. How can it be anything other than a deliberate and wanton attempt, however subtle it may seem, to change the basic structure of our nation, when it is clear, that by first attacking the Sedition Act, it opens the door, upon the demise of this bastion, for the basic structures to then be amended at will? “It is well settled that mere possibility of abuse of a provision of a law does not per se invalidate a legislation. It must be presumed, unless the contrary is proved, that administration and application of a particular law would be done “not with an evil eye and an unequal hand”. 27. In this regard that I’d like to reiterate what the learned former Chief Justice, Tun Abdul Hamid had previously said. While he made it very clear that the Sedition Act should not be repealed, as it protects the fundamental provisions in the Federal Constitution, certain provisions of the Act however could and should be amended, and this includes doing away with the bar from criticizing the government, as it goes against the very spirit and principle of democracy. But for the protection on the constitutional provisions and the administration of justice, as well as those provisions that protect race relations in our multi-ethnic nation, the answer is surely to be that rather than repealing them, they should be strengthened. 28. It is in this regard that I think we should all welcome, wholeheartedly, the announcement made by Prime Minister today, that the Sedition Act will stay, with two improvements introduced, namely that there shall be an insertion of a provision to protect the sanctity of Islam as the religion of the Federation, as well as any the other religions; and another provision to extend the definition of seditious tendency so as to include unwarranted calls for the secession of Sabah and Sarawak from Malaysia. *Aidil Khalid is a lawyer practising in Kota Damansara, and a senior fellow of the Center for Human Rights Research and Advocacy (CENTHRA). The above was presented on November 27, 2014, at the Speak No Evil forum held at KDU University College. The other speakers included Tommy Thomas, Philip Koh, Joshua Tay, and Associate Professor Dr Azmi Sharom. 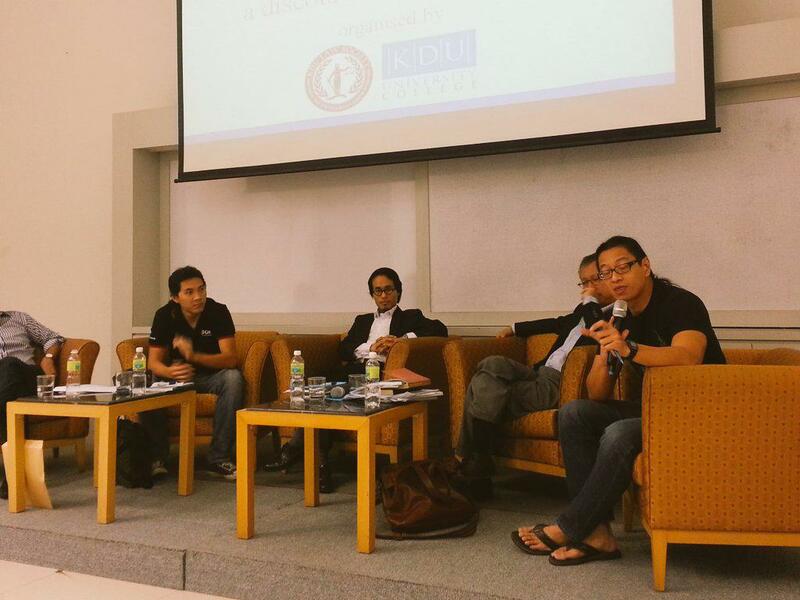 Aidil Khalid’s was the lone dissenting voice to the call for the decriminalisation of sedition. November 29, 2014 in Freedom of Speech, Sedition Act.